I have amazing news to share with you today...I wrote a book! I have been keeping the news under wraps until it came out, and now it's official. It was so much fun to write and the people I worked at the Taunton Press were absolutely wonderful. A special thank you to the press for the fantastic opportunity! There are photo frames, greeting cards, charms, and a whole lot more. This is a fantastic book to make things as a family or decorate a young person's room. I especially love that you can repurpose all of those yarn odds and ends and make a bouquet of lovely blooms. I had lots of fun covering this throw pillow in a kaleidoscope of blossoms...love it! Now is your chance to win you own! The good folks at The Taunton Press have generously offered an awesome book giveaway to FIVE lucky Fiber Flux readers. How neat is that? A big thanks to Taunton for sponsoring this giveaway! Enter to win NOW through October 23rd using the Rafflecopter below. Open to entrants 18 and over and the giveaway is open worldwide...now go, go, go and enter! Can't wait? Want to gift one to someone? Click below to purchase! For fun projects and pretty patterns, be sure to follow Fiber Flux on Google+, Facebook, Twitter, and Pinterest for the latest updates! Visit the Fiber Flux Yarn Shop for fabulous yarn at great prices! Congrats on the book! Very exciting! I love the wreath the best so far! I love the little flowers in the vase - cute. Thank you for the chance to win this creative book! I would make a bunch of bouquets for all over my house the are so colorful and beautiful! Love the memo board! Congratulations! Soy una gran fan tuya. Sigo todos tus proyectos y he realizado muchos de ellos. Todo lo que haces es fenomenal. Un abrazo desde España. How cool! It looks like something I would use. I especially like the memo board idea! Looks great. Cannot wait to make these beauties! That pillow you made in your book looks really cute. Congratulations Jennifer!!!! I'd love to win a copy, but I did try to click the link to purchase the book and the link was broken. Just wanted to alert you! :) I've been loom knitting for about a couple of years, though Crocheting is still near to my heart...I have some mini looms so I'd love to make some flowers and the book looks like some terrific projects in it that I'd love to try! Congratulations and thanks for the chance to win your book. 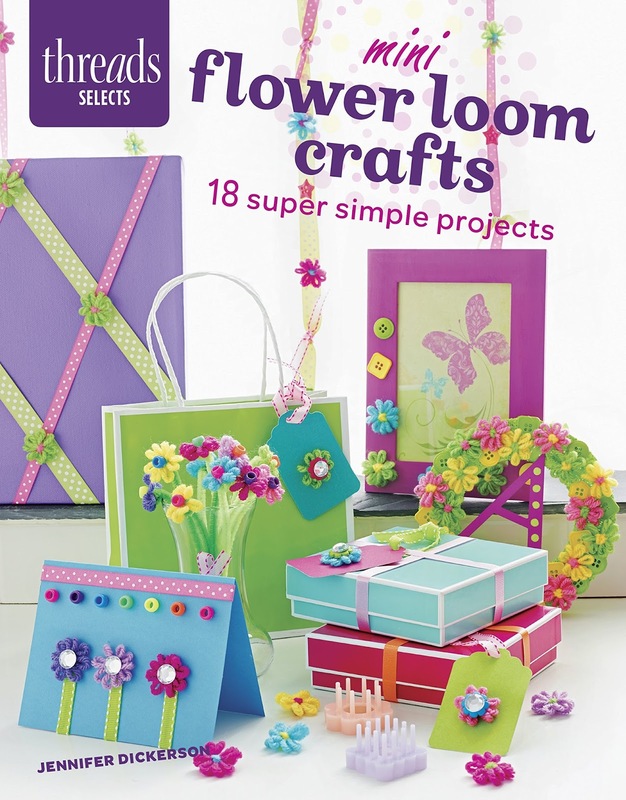 I just purchased the mini looms at Hobby Lobby the last time I went there. Karen R.
Perfect gift! Thanks a lot! Congrats on the book, I love the little flower arrangement in the photo! Wow !! I like to take my chance on this give away! My granddaughter and I will have so much fun with it. Congratulations!! I can say I knew you when!! That pillow is awesome. 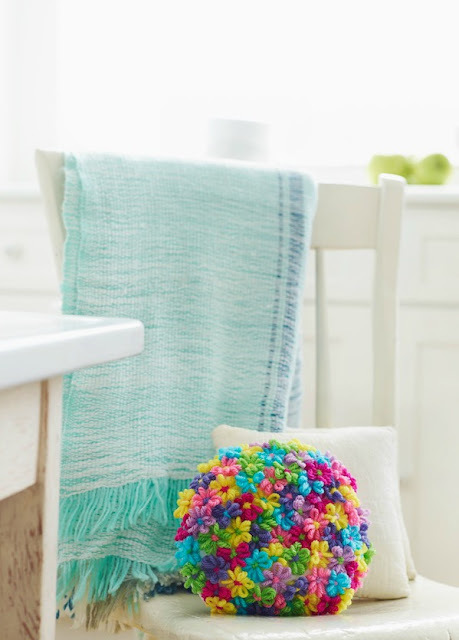 Looks like a great way to use yarn scraps too!! Congratulations, how exciting! I really like the pillow! congratulations on your book and Im so excited to have the chance to win it!!! Im so excited for you to expand your business!!! Good luck everyone!!! I love the memo board! This would be such a FUN book to have! I love the memo board, but the bag is also cute. Love these new little designs. 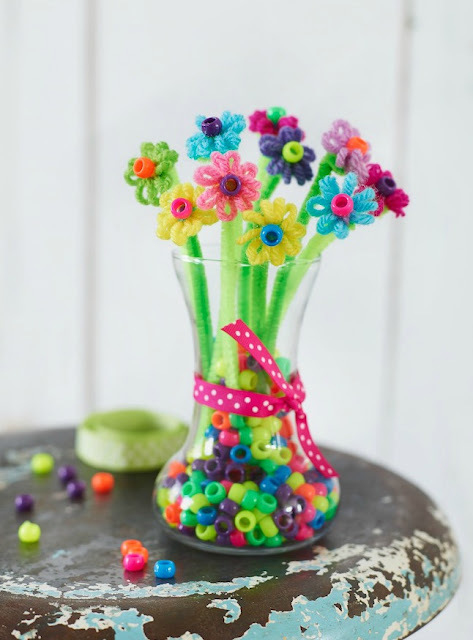 I like the yarn flowers, they are lovely. Oh the possibilities!! What a great book! So many things to make; so little time! Love, love, love your flower wreath! Congratulations on your new book. Bet it will be an astounding success. That pillow is amazing! What fun. I'd love to try this craft. I really love the throw pillow. Very bright and beautiful. I love the pillow. I am very interested in looking at more of this type of project! I have been looking for some ideas for using the flower loom. These projects are awesome!!! I especially love the round pillow. I cant wait to get my hands on this book! The throw pillow is super cute! Congratulations. I too love the pillow. Thanks. The pillow is a winner! I love flowers, colors and books on crochet. Congrats on the book! Love the cushion! How cute is that! I love the pillow as it is unusual, bright and colourful. This looks an inspiring book but I like the floral wreath best! I like the flowers in the vase but can not see what else is in your book as your links both go to a 404 error right now. The memo board is my fav! Very handy!